Fennel as a protection against evil may remain unproven but throughout history it has been used as an effective treatment for a variety of ailments. Fennel history dates back to Pliny (AD 23-79), the Roman author of The Naturalis Historie. He believed that serpents ate and rubbed against fennel because it was able to improve their eyesight after shedding their skins. Following that observation, Pliny believed fennel was so powerful that he used the aromatic herb to treat 22 different ailments. In our fennel history timeline, we come to the 1300s. We know that fennel was a staple in the household of King Edward I of England. His wardrobe account books from 1281 listed a purchase of 8 1/2 pounds of fennel seed – a month’s supply. Why so much? Fennel seed was used as a condiment and an appetite suppressant. On Church mandated ‘Fastying dayes’, the faithful used fennel to get through the day, a tradition brought to the United States by the Puritans. They would bring handkerchiefs with fennel seed to nibble on during long services to stave off hunger; which led to fennel seeds often being referred to as ‘meetin’ seeds’. During medieval times, evil spirits were thought to roam freely as the sun turned southwards. Fennel, when hung over doorways, was thought to protect those within from the spirits. Fennel seeds inserted into keyholes were thought to protect a dwelling from ghosts on any night but particularly Midsummer’s Eve. Hippocrates (yes, he’s the fellow the physician’s oath is named for) suggested fennel could aid wet nurses to increase their milk supply. When steeped into a tea it was believed that fennel was also a treatment for losing weight. The Greeks called it Marathron which is derived from a word meaning to grow thin. History of Fennel as an Antidote. 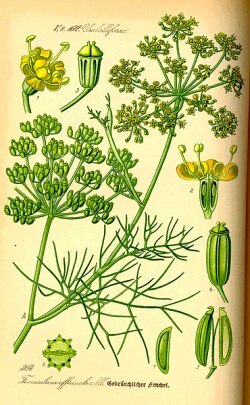 Fennel was used as an antidote to poisons by the Romans, Chinese, and Hindus. Culpepper also believed fennel to be an effective antidote for poisonous mushrooms and snake bites. A plaster of fennel roots was a traditional treatment for the bites of mad dogs. Our Herb Garden also has guides on Growing Fennel and Fennel Companion Planting.